Can you imagine how much President Donald Trump and NBA superstar LeBron James could accomplish together for the benefit of young black Americans if they set aside their egos and political differences to work together? So, what’s stopping this from happening? I doubt it’s what you think. As distasteful as some of Trump’s tweets can be, they’re not to blame for the wedge that exists between black professional athletes and Trump’s administration. Let’s be honest, James couldn’t reconcile with Trump if he wanted to - the left simply wouldn’t let him, even if it meant helping more at-risk children in Akron, Ohio. Furthermore, Trump isn’t to blame for using sports to divide Americans as LeBron claimed in his interview with Don Lemon of CNN last week. The blame lies at the feet of ESPN, which has turned the network into a divisive social justice channel, and former NFL quarterback Colin Kaepernick, who started kneeling during the National Anthem to protest police brutality. Trump did nothing more than react to the controversy like most football fans. The outrage from fans was never that Kaepernick didn’t have the right to protest, most fans believe he simply chose the wrong venue to do so. As usual, Democrats capitalized on Kaepernick’s protest to further their own political agendas. The truth is the same today as it was then, if Democrats are to win big in the midterm elections they must maintain the narrative that Trump and his Republican, conservative and religious supporters are racist, homophobic and xenophobic bigots. As long as Democratic voters are distracted by their anger towards Trump (the MSM plays a big role in cultivating that anger), leaders in the Democratic Party know that Trump won’t be judged based on the positive impact that his policies have had on the black and Latino community. Voting Republican this year should be a no-brainer for most registered voters given the economy. But, that won’t be the case. As evidenced by LeBron James, far too many millennials get their news from sources that are biased against Trump no matter what he does. The truth is, both James and Trump are working hard to make America a better place for less privileged Americans. As a capitalist, I believe Trump’s vision for America, including allowing more Americans to keep more of their own hard-earned money by cutting taxes, and promoting alternative means of education such as trade schools and home-schooling, will have greater long-term benefits for all Americans than James’s #IPromise school. James’ school takes a big government approach. 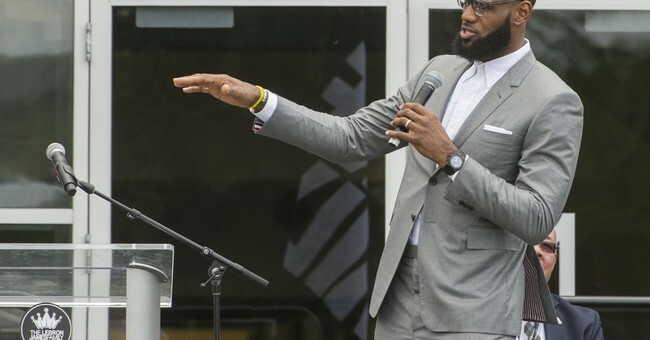 He promises a bunch of free giveaways to 3rd and 4th graders, with local taxpayers potentially footing up to 75 percent of the bill, according to an article in Cleveland.com titled “Who’s paying for Lebron James’ new I Promise school? Lebron or Akron Public Schools?” As reported by CNN, the 240 kids set to attend the school, a project led by the LeBron James Family Foundation, will receive free tuition, free uniforms, free breakfast, lunch and snacks, free transportation within 2 miles, a free bicycle and helmet, access to a food pantry for their family and guaranteed tuition for all graduates to the University of Akron. “What’s more, parents of students will receive access to job placement services and help acquiring their GEDs.” Assisted by Akron County educators, the school will focus on STEM education and developing problem-solving skills. Personally, I’d love to see each NBA team adopt a school in their community and totally foot the bill without the help of taxpayers, so they’re completed vested in the children’s success and hiring qualified teachers that will teach children to think, not to conform to left-wing ideology. Regardless of my feelings towards LeBron’s approach to education, both Trump and Lebron James deserve credit for their hard work in creating a better America for everyone. I just wonder how much more they could accomplish together if they used their platforms to inspire local governments to develop their own programs that will better serve our young men and women across the country. It’s clear that what we’ve had in place over the last several decades isn’t working. Surely, the president is responsible for the lowest black unemployment numbers in recorded history, and an athlete as admired and inspirational as LeBron James is in urban America could sit down and figure it out.